PrimeFaces 3.4 came out three days ago. Beside the usual awesomeness of new and updated components it also includes the new PrimeFaces Push framework. Based on Atmosphere this is providing easy push mechanisms to your applications. Here is how to configure and run it on latest GlassFish 3.1.2.2. That is all you have to do to configure your domain. That was it! On to the code! I'm going to use the example referred to in the PrimeFaces users guide. A very simple example which has a global counter which could be incremented. * value and new value is pushed to all subscribers. That is all for now. 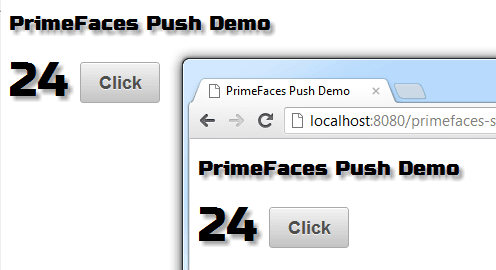 Congratulations to your first PrimeFaces Push example. Have fun playing around with it!